When it comes to criminal justice, Alberta ranks seventh in the country, worthy of a B grade, according to the 2017 criminal justice report card being released Monday by the Macdonald-Laurier Institute. The grade is an improvement from last year’s C+, but it has dropped in rankings to seventh from sixth. The province was given a failing grade of F for the most disproportionately-high level of Indigenous incarceration of any jurisdiction in Canada. The province has not reported the number of Indigenous persons admitted into prisons in the province since 2012, the only province in the country that doesn’t. Ben Perrin, co-author of the report, said the institute pointed out the concern in its last report. 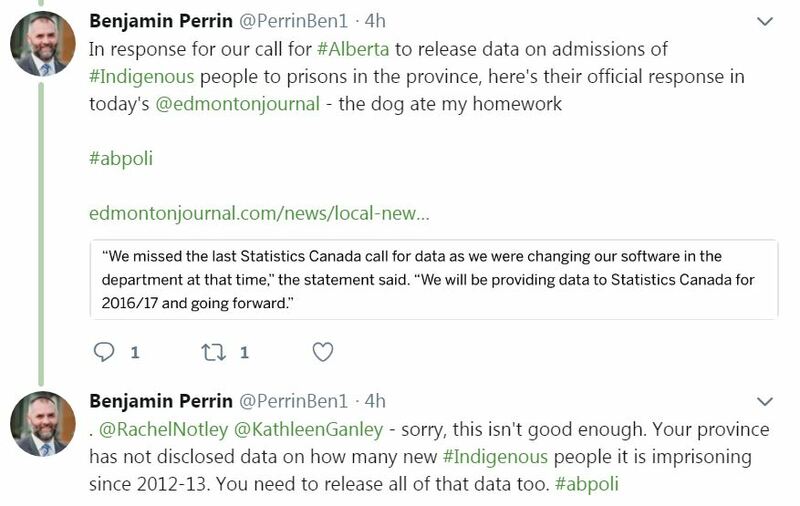 “They should be releasing the data for the years it has been concealed because this is a serious matter of public importance and concern and raises grave concerns about the criminal justice system in Alberta when they won’t even give us numbers of the number of Indigenous people being sent to jail in this province,” Perrin said Friday. Monitoring new admissions is needed to turn the tide on the disproportionate level of Indigenous people being incarcerated. 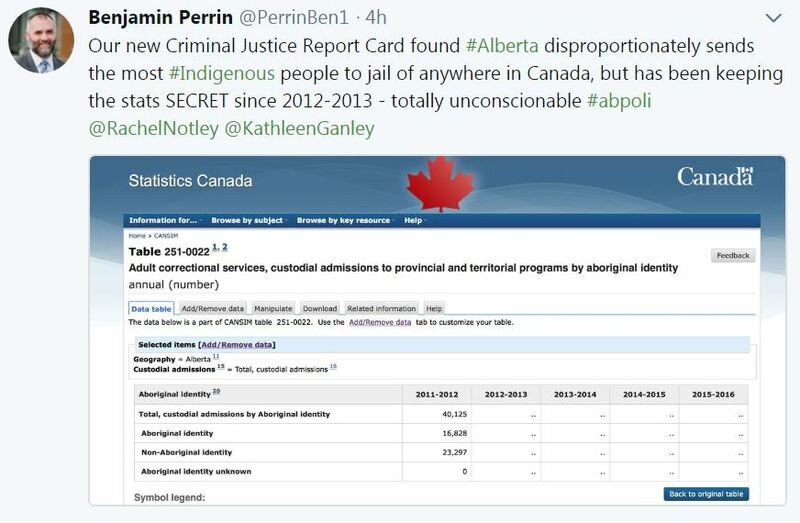 A statement from Alberta Justice and Solicitor General said the department keeps a record of inmates’ background information including ethnicity upon admittance to a provincial correctional facility. Alberta has one of the highest property crime rates among the provinces, which has climbed significantly since 2012. It also has one of the lowest weighted clearance rates for both violent and non-violent crime. “You’ve got more of it and less of them are being solved — it’s not a great record on property crime,” Perrin said. Alberta received a D grade for police responding promptly, based on 2014 numbers. The province has a higher-than-average proportion of criminal charges stayed or withdrawn and more accused persons on remand per 1,000 crimes than other provinces. In Alberta in 2016, more than 35 per cent of cases had charges stayed or withdrawn. The only province worse was Ontario at 43 per cent in 2016. By comparison, Quebec sits at 7.4 per cent. “It’s quite stressful and even devastating for people to be under the cloud of criminal charges,” Perrin said. As of 2016, Alberta had close to seven accused on remand per 1,000 crimes. There are positives in Alberta. The report awards top marks to the province for its average daily inmate cost in dollars. Alberta also has among the lowest rates of breach of probation. Police officers are also highly efficient, processing a large number of criminal charges.